We are so proud of you-Headteacher award!! I’ve taken the happiness balloon home!! I followed the Y Foryd Values. I worked quietly and got a fuzzy friend. We were the dojo superstars this week! Well done for your Kick it award! My friends are proud of my swimming certificate. We took the empty food bowl out. We gave them clean water. We love chatting to them. Steve and Louis came to visit us! They were being very nosey! We heard them ‘talking’ to each other. They were exploring the classroom. We loved caring for them! We love having school dinners. Look at my healthy lunchbox! I can put my shoes on on my own. I can close my zip on my coat. We got dressed up using funny clothes. It's sometimes tricky - but we keep on trying. 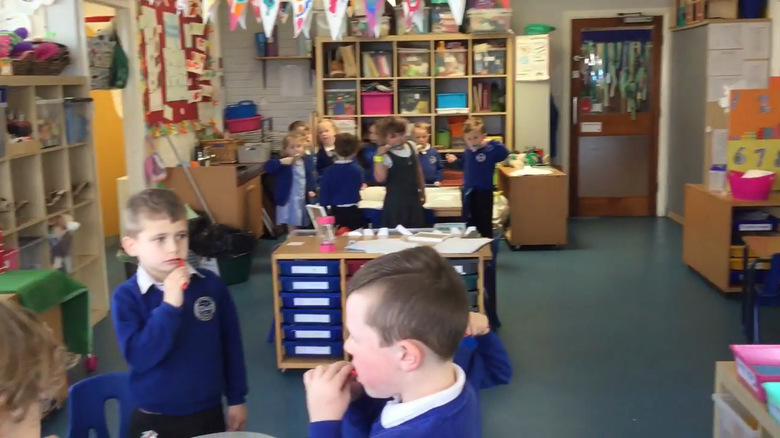 We use a timer to help us count how long we should brush our teeth for.